Hi, my name is Corinne, I’m an academic and have spent the majority of my life living in other countries. I have, however, spent the last 15 years in this country whilst my children finished school and college. Prior to that we’d lived in Athens Greece for 15 years. As a child I travelled with my parents abroad as a “forces brat” and then at 18 I set off with a backpack, £50 and a single ticket to Naples on the then Dan Air, known as Dan Dare for it’s air safety record. I came home 22 years later with my 2 children in tow. In that time I backpacked around Europe living in hippy communes in Stommeln, Germany, caves in Crete, under olive trees in Saphos, a snazzy garden flat in Athens, a student hostel in Luttrech in Holland and many, many more places in-between. I met my partner Terry in England and we are now a family of 6 children and 2 grandchildren. As is the case in modern blended families we see some of them all the time, some sometimes and sadly some never. We’re working on that. Both Terry and I see the world with a harmonious eye but not necessarily an eye that other people see through. 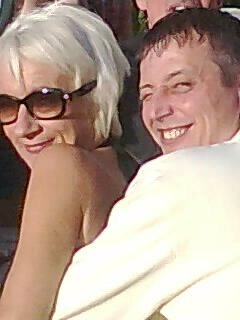 To that effect we are moving to Bulgaria to set up what Terry refers to laughingly as Terrys Kingdom. Perhaps that’s what I should have called the blog! I’d like to say this is a recent shot but it’s about 4 years old. We don’t often have our photos taken, we see each other all the time so there doesn’t seem much point! Glad I stumbled over comment on the one Facebook page. I moved to UK from South Africa 4 years ago but as it is with Terry I dream of living off the grid. My partner (Cheryl) will back me all the way as long as she can have a flushing toilet and electricity Lol. So Bulgaria looks a great compromise. We are still a few years away from taking the plunge, need to save to buy a place. Kind regards and best wishes for you and your family for 2017. Hello. I’ve just seen your blog and just HAD to comment :). I hope to buy a property in the next few years in Bulgaria (I’ve got about 5 villages on my list so far that are strong contenders). I won’t move over full-time for probably 10 more years, sadly. So to satisfy my love for Bulgaria, I am finding every blog I can and reading every entry! I am slowly working through yours but it’s a slow process because they’re so long (a good thing, though!). I have a question… What drew you to choose Gradishte? Or, if you’ve explained it in a blog that I haven’t seen it, feel free to send a link to it. Also, I work (and will work in the future) online as a TEFL teacher. I need a line-based internet and trying to find villages with this is proving difficult. Does Gradishte have this?